Japan has a wide variety of traditional motifs. We are inspired by those motifs, and mainly focused on lovely creatures. Every motif has its own meaning such as happiness, luck, and success. We also focused on myths from ancient times in Japan. It is our policy, however, that design should not be so excessive so as not to distort the message contained in the letter. 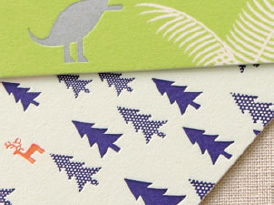 We hope these cards will be your messengers to your loved ones. 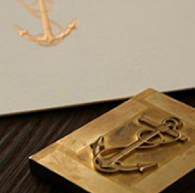 Each embossed mark is elaborately finished from a brass plate manually by engravers. The bright colors on the edge of the paper are hand painted. These processes take a long time; however we believe that the craftsmen's work gives this series a higher degree of sophistication. For this series, we selected original cotton paper. Our contracted paper mill sits at the foot of Mt. Fuji, and a plentiful supply of pure mountain water makes soft and beautiful paper. It took three years of tests to finally discover the perfect way to make our original cotton paper. 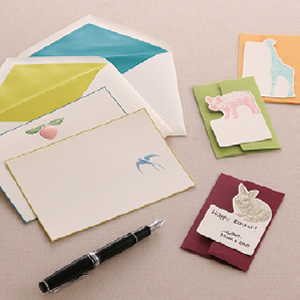 These cards can be used on any occasion, such as for greetings, birthdays, and thank yous. The motifs on each card have special meanings. For example, it is said that peach is a symbol of good luck,and the swallow has been a symbol of freedom for a long time in Japanese culture. It would be more fun to create your own meanings for each motif. The adorable octopus will give your precious person a big-big hug with your message. 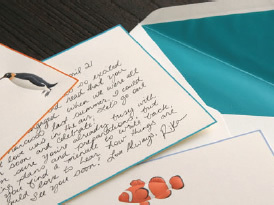 The smiley clownfish will make you smile more when you write a letter. 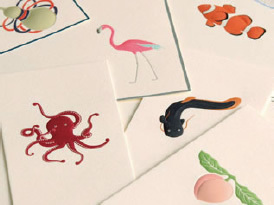 Please enjoy these lovely cards and add your own touch of creativity! So many beautiful things exist on the earth. 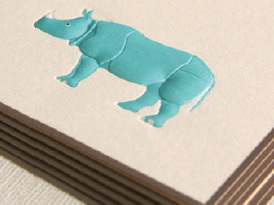 We thought we would express and produce these grand creatures into our stationery. 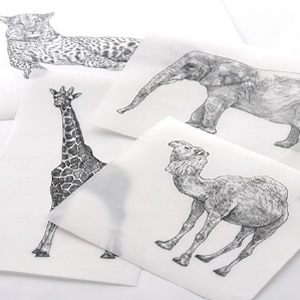 In this 602 series, we selected wild animals as it's main theme. We drew the beautiful creatures with life like features. 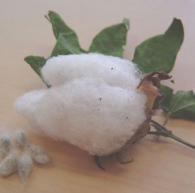 We use our original cotton paper, which are exclusively produced at the foot of Mt. Fuji in Japan. Plenty of pure water from the mountain makes this wonderful cotton paper. We spent many years producing this paper by trying many tests, and made the best one, which truly matches with fountain pens. 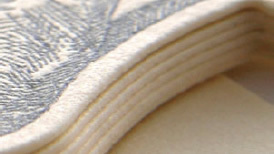 In this 602 series, we selected the thick cotton card. Thus, you can feel the soft but strong texture. 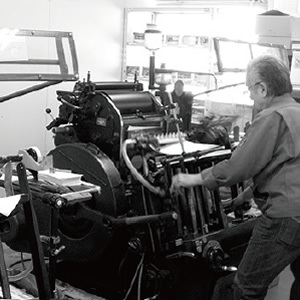 We have decided to use letterpress printing for this series to strengthen their intricate designs. 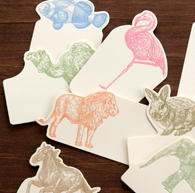 The letterpress printing matches with cotton paper. We set the printing machine with high pressure. Then, we print the designs onto the cotton cards with care, so that people can feel the fine and uneven texture of the cards. If you can visit our store, please touch the cards to feel the fine texture. Courtesy of the Japanese painter, Haruyuki Katayama, these beautiful flower prints have been arranged in traditional color schemes to create a true Japanese style. 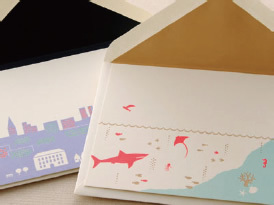 Boxed set of 6 cards and envelopes lined in a coordinating color. These designs originated in traditional Japanese crafts. Some, such as ume and kiku (plum and chrysanthemum), are typical kimono designs. Okame, on the other hand, derives from festival masks which are common in Japan. Aoi is an original family crest (kamon). 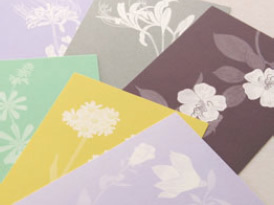 As for the material, we selected cotton paper so that people can feel the taste of luxury. It would be wonderful if you could feel something of the character of Winged Wheel's philosophy from this series. 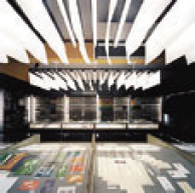 The theme of the series is "landscape." We have designed unique views freely beyond time and space. Creatures look like starting to move and the scenes of full of life will make you imagine the rest of the story told on the card. 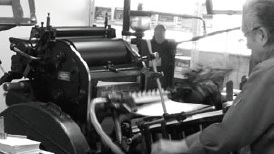 Various sceneries are expressed by the combinations of offset and letterpress printings. Opening this envelope releases vivid colors into the atmosphere! About 1000 years ago in the Heian period in Japan, noble women used to wear Heian style kimonos. At that time, they enjoyed the fashion of putting on more layers of kimonos with different colors. They loved the endless possibilities of color-co-ordination to create different effects. We are inspired by this ancient custom, and our designer selected vibrant contrasting colors that tantalized the eyes. The white-bordered line is hand painted by our craftsmen. The DLS size is unique to Winged Wheel, and is perhaps perfectly suited for invitations and other special occasions. 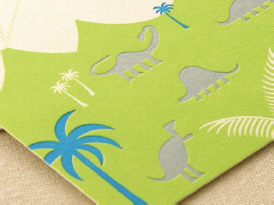 The fine, soft, distinctive texture of 100% cotton fiber paper is praised as paper of the world's highest quality. The paper is completed only after repeated test productions to maximize suitability for writing. 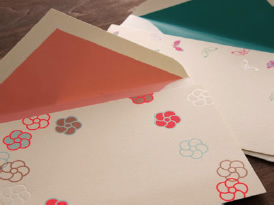 On the other hand, traditional Japanese paper is aesthetically pleasant while retaining tough, hard-to-tear characteristics; the fine fibers achieve the thin, smooth quality and the long fibers add strength. The extraordinary beauty of traditional Japanese paper is based on air permeability and translucency as well as durability. Each embossed mark is elaborately finished from a brass plate manually carved by engravers. 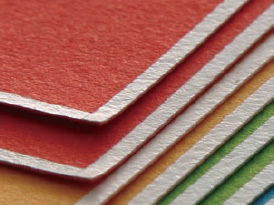 The bright colors on the edge of paper are not printed but manually tinted. All are time-consuming processes essential for creating the distinctive products with a three-dimensional impression and thus require craftsmanship. Japan has a variety of traditional motifs. We faithfully reproduced such excellent motifs or expressed them in new ways by adding color. It is our policy, however, that design should not be so excessive as to distort the message contained in the letter. 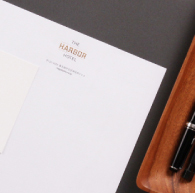 Winged Wheel offers a variety of paper and motifs that fit most letterheads. We are able to accommodate requests for developing original designs as well. You may add a touch of Japanese culture to Western style by using traditional Japanese paper for a marriage of two different cultures. Nowadays, many young people seek originality in their wedding ceremonies and banquets. Most of all, they are intent on reflecting their taste in the invitations. Winged Wheel can suggest hundreds of designs by combining elements, while offering an expanded line of designs from basic to the delightful. An increasing number of people use personalized calling cards. It can be a personal communication tool expressing who you really are. We can recommend a style that is most appropriate for you from an ample selection of materials, colors, and motifs. Store has a wide assortment of merchandise, including very simple, plain postcards and greeting cards, and new products are added to the lines each season. Customers can freely select whatever they like for an original gift set. Our roots extend back to the early 20th century. Our company was established in 1918 by Keijiro Sugiura. We are now a third generation family business company. 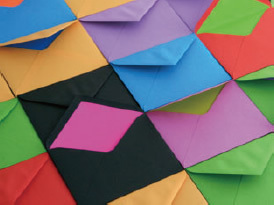 The founder, Keijiro Sugiura, started his business as an envelope manufacturing company, called "Haguruma Envelope", which is now one of the leading companies in the Japanese envelope industry. 80 years later, our third generation president, Masaki Sugiura, established Winged Wheel in 1999 as a subsidiary of its retail division. 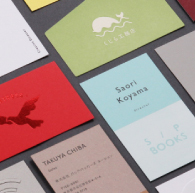 With a strong passion for fine paper and letter writing culture as an alternative to the digital world, he started to consider a new style of stationery store, which existed nowhere in the world, and thus Winged Wheel was born. It is our strong desire that people will freely compose messages to their loved ones using our unique materials.